When I moved to Oxford I rather disapproved of the hostel next door, with its Victorian attitude to young, single mothers. I was not surprised when our local vicar told me that it was run by the ‘Skene Moral Welfare Association’. 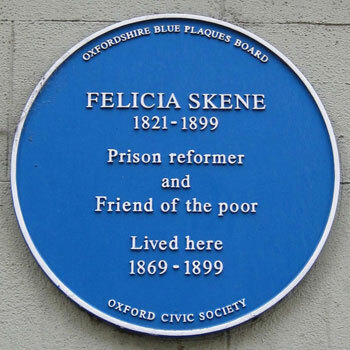 I then learned that the Skene in question was Felicia Mary Frances Skene, one of the most radical women in nineteenth century Oxford. I was even more amazed to discover that she was my grandfather’s great aunt, known in the family as ‘Fifi’. I decided to find out more. 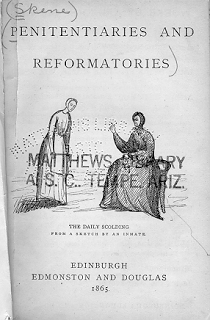 Her father James, was a wealthy Scottish lawyer and amateur artist whose engravings illustrated Walter Scott’s novels. Born in 1821, Fifi comforted Scott with fairy stories the night in 1825 when he lost everything. Roused by her cheerful spirit, he decided to fight bankruptcy and work through his debts. Scott wrote that Fifi’s parents ‘bring so much old-fashioned kindness and good humour with them that they must be always welcome guests.’ They were also enterprising and resourceful. Fifi’s father James Skene of Rubsilaw, 1775–1864, with two of his grandchildren. James Skene believed that travel was the best form of education and led his family on a grand tour around Europe. Fifi was taught the piano in France by Liszt, whom she described as ‘a wild-looking, long-haired excitable man’. Between 1838 and 1845 the family lived in Athens where Fifi sang with the Greek royal family. During an expedition on horseback across the Marathon plain, she spent the night in a shack with Albanian peasants and their pigs. At the age of twenty-four she brought her young nieces aged ten and eleven (one of them my great grandmother Janie) home from Athens by ship and train via Constantinople. Arriving in England she wrote her first book Wayfaring Sketches among the Turks and Christians, first in French and then in English. Her observations of conditions in slave markets, galley- ships and an Ottoman Pasha’s harem made it a bestseller. The Skene method of education obviously worked. Her older brother James Henry married a Greek aristocrat and became a British Consul to Aleppo. Fifi’s brother George was Professor of Law at the University of Edinburgh and Sheriff of Glasgow, and another brother William became the Historiographer Royal of Scotland, writing the first academic history from Scotland’s point of view. One of her sisters married the Swedish ambassador to Washington, Berlin and Paris, and the other married a Greek aristocrat – the brother of her sister-in-law. Fifi, left, with her niece Zoe Thomson, wife of the Archbishop of York, and her brother William Forbes Skene, Historiographer Royal of Scotland 1892. 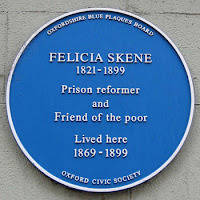 Her 1866 novel Hidden Depths was an exposure of prostitution in Oxford inspired by the injustices she had witnessed in the prison and women’s reformatories. The Athenaeum criticised her writing as ‘unrepresentative of society’, The London Review disapproved of the message and Mudie’s Library considered the subject-matter altogether too provocative. The Lesters: A Family Record warned readers of the dangers of alcohol but was denounced by Saturday Review as being ‘cheap melodramatic horror’ and ‘almost beneath criticism’ while Academy dismissed the novel as dull and destined for failure. Fifi’s social views were just too progressive for 19th century male critics. Attracted by intellectual life, Fifi persuaded her parents to move to Oxford where she settled down as a writer and philanthropist. Despite countless offers, the auburn-haired and boisterous Fifi was far too busy to bother with marriage. She didn’t want to belong to a man and much preferred to carve out her own life. Fluent in both French and Greek, and possessing a photographic memory, she published more than twenty books under the pseudonyms of Oxonesis, Francis Scougal and Erskine Moir. Her interest in the high-church ‘Oxford Movement’, inspired a theological work The Divine Master, which ran to eleven editions. She wrote for Blackwood’s, Cornhill and Macmillan's Magazines, Quiver, Temple Bar and Good Words, which had a circulation of 100,000 and featured contributions by Thomas Hardy and Anthony Trollope. 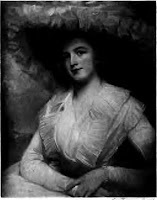 Published under the the pseudonym Erskine Moir, her novel Through the Shadows had more success and The Spectator stated it to be ‘the outcome of a most refined, religious, and poetical mind’. The Skene Arms, left, in St Michael’s Street, Oxford. 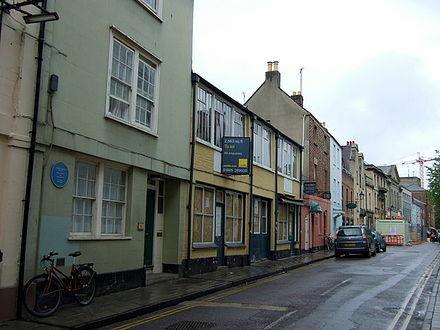 For most of her life Fifi lived in St Michael’s Street in the centre of Oxford. It’s nickname was ‘The Street of Seven Deadly Sins’. Her home was known as ‘The Skene Arms’, because it was always open to beggars, clergymen, prostitutes, politicians and students. In her Cornhill Magazine article ‘Ethics of the Tramp’ she wrote that like her parrots, men of the road should roam free and never be incarcerated. She braved the wrath of local pimps and drunken husbands by finding refuge for women fleeing prostitution and domestic violence. whom she nursed though diphtheria, 1875. After years of impromptu visits to Oxford Prison accompanied by Tatters, her Skye terrier, Fifi became England’s first official female Prison Visitor. She insisted on complete confidentiality and demanded that male and female prisoners be housed separately, for the protection of the women. On their release, she gave prisoners a hearty breakfast and a reference for employment. She even organised marriages to legitimatize the children of ‘fallen women’. Independently of any political movement, she fought for prisons to be used for rehabilitation; for the abolition of capital punishment; and for the decriminalization of suicide. She also campaigned against female inequality, animal vivisection and religious intolerance. When the Prime Minister, W.E. Gladstone, asked her advice on the new theory of evolution, she told him that Darwin’s discovery was true, and compatible with Christianity. Fifi, 1821-1899, in old age. Fifi died of bronchitis in 1899 and was buried in St Thomas church, near Oxford railway station. A century later the assets of the Skene Moral Welfare Association were redistributed among Oxford’s social housing associations. In old age, Fifi had said of herself, ‘I am like the Martyr’s Memorial – everybody knows me and no-one is interested me.’ Beyond Oxford, she has largely been forgotten, but in 2002 a blue plaque was erected outside her home, now a hostel for single men. The plaque describes Fifi as ‘Prison reformer and friend of the poor’ but there is no mention of her literary achievements. At times I have felt that my own career, which is split between writing popular history books and international development, confuses people. Great Aunt Fifi demonstrated that a woman can have as many different careers as she likes. 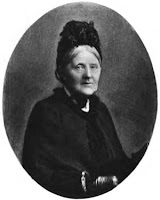 Some of her titles: Wayfaring sketches among the Greeks and Turks, and on the shores of the Danube by a seven years resident in Greece, 1849. The Isles of Greece, and other poems, 1843. Use and Abuse, a tale, 1849. The Inheritance of Evil or, The Consequence of marrying a deceased wife’s sister, 1849. The Tutor's Ward, 1851. The Divine Master, 1852. S. Alban’s, or, the Prisoners of Hope, 1853. Hidden Depths ,1866. Still and Deep, 1875. Memoir of Alexander, Bishop of Brechin, 1876. Raymond, 1876. Life of Alexander Lycurgus: archbishop of the Cyclades, 1877. More than Conqueror , 1878. The Shadow of the Holy Week, 1883. A Strange Inheritance, 1886. The Lesters: a Family Record, 1887. Through the Shadows: a Test of the Truth, 1888. Awakened. A tale in nine chapters, 1888. Dewdrops: selections from writings of the saints,1888. Scenes from a Silent World, or, Prisons and their Inmates, 1889. What a fascinating and uplifting story! Thank you for this post.